Raised in rural Kentucky poverty and married at the age of 13, Loretta Lynn (Sissy Spacek) begins writing and singing her own country songs in her early 20s. 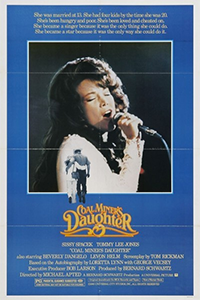 With the tireless help of her husband Oliver "Mooney" Lynn (Tommy Lee Jones), Loretta rises from local honky-tonks and small-time record deals to national tours and hit singles, befriending her idol Patsy Cline (Beverly D'Angelo) and becoming a country music icon despite the toll stardom takes on her family and her marriage. Presented by Select Pix at the Lindo Theatre on Wednesday, June 5th at 1:00 PM and 7:00 PM. Admission $6.